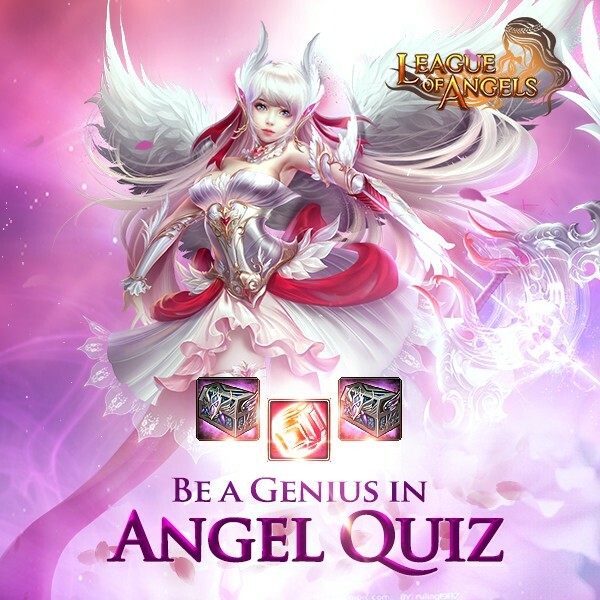 North America Forum»Forum ›League of Angels ›News and Announceme... › Have Fun in Angel Quiz and Loralei's Wardrobe! 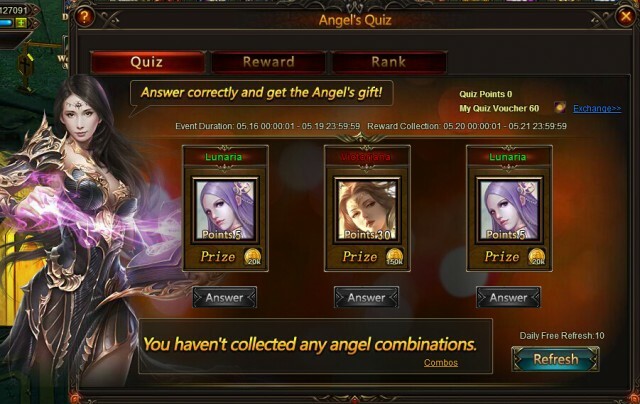 Have Fun in Angel Quiz and Loralei's Wardrobe! Loralei\'s Wardrobe is a feast specially for fashion! It consists of 2 different components, diamond purchase and voucher purchase. During the event, the more players who purchase the same items, the higher discounts they can get for the items. The discount can be as high as 50% off. The costumes in this event include Lover\'s Reunited, Superior Santa Clothes, Elvish Spring, Legacy, Superhuman, Iron Wings, Mysteral Wings Shard, Hang Ten Shard, Moonbeam Wings Shard, Sterling Moonbeam Shard, Bat Wings Shard, Wings of Rhythm Shard, Gold Organza Shard, Wings of Gold Shard. 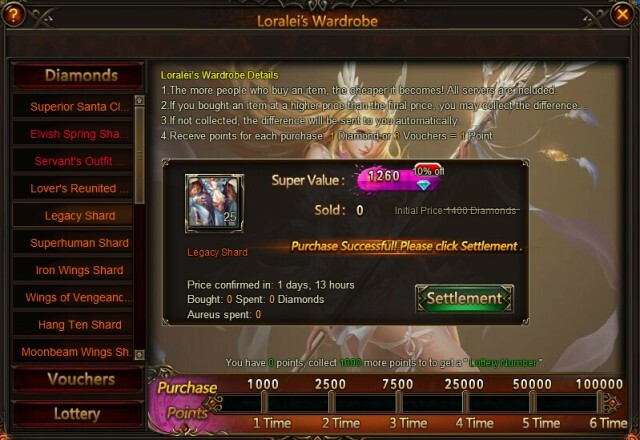 3.Aureus can be used in the Loralei\'s Wardrobe to purchase certain items. 1 Aureus is worth 1 Diamond. Aureus can be obtained from the events Total Recharge and Today’s Gift,etc. Tips: Group Tickets are still valid for the next Loralei\'s Wardrobe event. 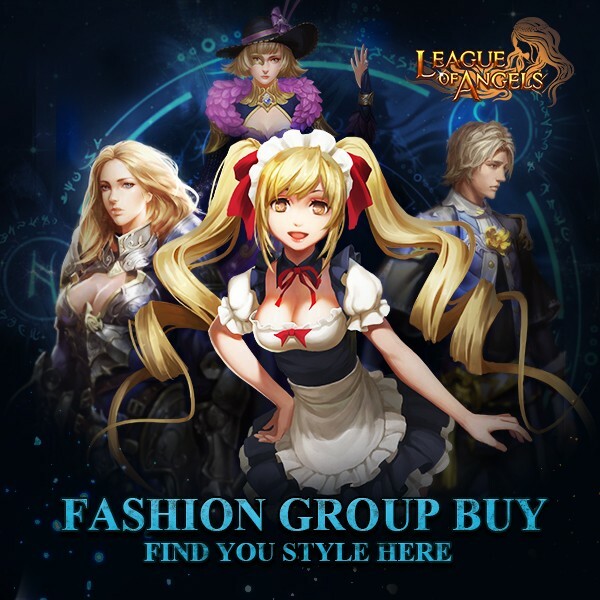 The first time each day a player buys each specific item in Loralei\'s Wardrobe, they will get a chance to draw in Lucky Draw. Prizes include Loralei\'s Wardrobe points and Vouchers. There is also an item that gives a 100% refund on the first purchase of the day! Description: Log in every day to win Quiz Voucher and other items! you\'re the new frog i assume. ANd again stupid phoenix wings REALLY this game never gona grown up everytime same and same stupid ussles items Just no coment on next update add another artifact jokers ..
i think the moonbeam wings will be free once initial purchases are done. and you can always purchase extra shards to smelt later, that\'s one way to use the aeruas, hope that helps, i agree they need to add some of the newer gear, but thats how GT does it. 2019-4-22 09:02 GMT+8 , Processed in 0.079335 second(s), 52 queries .